This bodhisattva, portrayed standing and making the symbolic gesture of absence of fear, displays all the characteristics of Gandhara art, commonly known as “Greco-Buddhist” art. 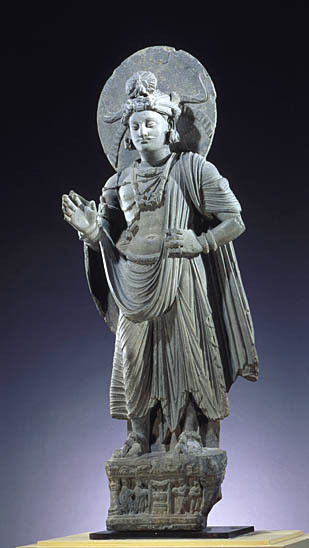 Indeed, Gandharan sculptors drew inspiration from the Hellenistic canon for these early representations of the Buddha; for instance, the clinging drape of the traditional dhoti worn by the figure here. The naked torso is covered with jewels; the finery combines Indian, Scythian, Greco-Roman and Iranian influences. The urna above the nose, together with the webbed fingers of the right hand, reveal the figures superhuman nature, in accordance with Buddhist canonical texts. The plinth is also decorated with a Buddhist scene depicting donors worshipping the Enlightened Ones begging bowl. The piece perhaps represents the future Buddha before his renunciation of worldly things and while he is still Prince Siddhartha Gautama or, alternatively, the bodhisattva Avalokiteshvara. The bluish-grey schist sculpture is executed in very high relief rather than in the round, and comes from the Mekhasanda monastery on Mount Mahaban overlooking the Shabaz-Garhi site. It illustrates the range of influences that characterized Indian art under the Kushan dynasty whose kingdom extended from Northern India to Afghanistan. The region witnessed a major expansion of Buddhism, and Kushan Buddhist statuary which reached its pinnacle in the 2nd and 3rd centuries is highly important. It was effectively the first school to create human representations of the Enlightened One who, up till then, had only appeared in symbolic form. And it was via such representations that Buddhist iconography was to spread, ultimately to China, along the Silk Road.